In his tent with all his friends in a pile. If someone handed you a box of abc's and asked you to put them in order, that would be easy, right? What about a box of numbers? Of course you could. Because those things always go in a specific order. But what if I handed you a box of random animal shaped magnets? How would you put those in order? Well, Noah puts some sort of order to those things but we couldn't figure out why he was choosing that order. The alphabet, of course, he knows in order. He loves putting them in order. Actually, he likes taking them, one by one, out of a disorganized pile, in order, and making another disorganized pile just so he can do it all over again. The point is, it's easy for him. It's so easy, in fact, it's boring now. But there are other things he's been putting in a specific order lately. For example, he will find all his stuffed animals from different rooms around the house and bring them all together, into one big pile. (You're going to notice a "pile" theme here). He has about ten of them, including a very old, very large, worn out, one-eyed tiger that was his mommy's favorite when she was a little girl. He also has 4 Elmo's, a little red dog (his favorite), an elephant, a moose, an old baby doll of mine he found and a few other ones that don't seem to warrant a permanent place in his line up. Once enough of his little friends are sitting in his lap and spilling over onto the floor, he's happy. He grins and giggles and kicks his little legs like he's in a bathtub and he's waiting for a splash of fur and stuffing to bubble up. and there were domesticated animals, like a cat and a dog. Noah loved them instantly. Not for the purpose of putting them on the fridge, of course, but because, you guessed it, he loved making piles with them. 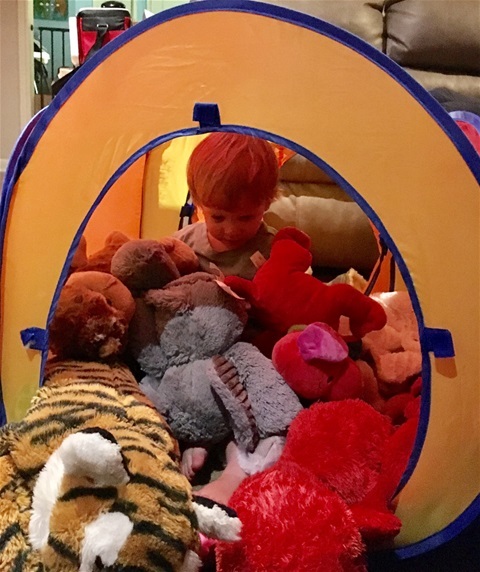 The first time we handed him the box, he took each one out, studied it very closely - and when I say closely, I mean that literally; like, right in front of his nose - while Sara named each animal and then he would put it in a pile in his lap. Sara would patiently name each animal as he picked it up from one pile and inspected it very closely all the way to its next pile/place to drop it off and he would run back to get another one, grinning the whole way. Sara would name each one again as he picked it up. Soon, a pattern started to emerge. She noticed he would always pick up the lion first and then came the cow, then the giraffe. We thought maybe size was the order. But, then he went for the duck, which was one of the smallest ones. And then the cat. The rest of the pattern, I won't bore you with, (and it got pretty jumbled after that anyway) but we couldn't figure out any rhyme or reason to it. I'm still searching thru his animal puzzles to see if that can give me a hint. But so far, I don't see it. Then Sara and I read a book written by a young, non-verbal autistic author that said some autistic children's memories work much differently than ours and Sara, with all her motherly intuition, realized that Noah might put things in a specific order to help him in a very ingenious way. Imagine your memories as a nice, straight cord with little white lights along the whole length of it and each one of those little lights represents a memory. The memories that happened yesterday are bright and close together. Close to you. But the ones from a long time ago are more dimly lit, towards the end of the cord and a lot further apart from each other. But you instinctively know where each light is on that cord. They are all in chronological order, in a straight line, so you can reach into the recesses of your mind, follow that straight little cord and pull out a memory. You can find one, dim little pinpoint of light, way down at the end of that cord and remember what you wore on picture day in first grade. You know how far back your cord goes and you know where to find each little light. Even the really dim, foggy ones from first grade. And the thing is - you do this effortlessly and unconsciously. Now imagine that same cord with all those same little lights but now it looks like a giant, tangled web of Christmas lights you just pulled out of a box in the attic. It's all just a glistening assembly of shimmering lights and long, dark cords and it's all jumbled together. I would imagine there would be a few shiny ornaments tangled up in them too, just because......you know......autism. there are no dim lights from a long time ago and there are no bright ones from yesterday. It's just a whole bunch of little white lights. Every memory is twisted and looped together, with seemingly no beginning or end; so you can't find a specific memory when someone asks for it. This might be what it's like for Noah. If I hold up the giraffe and ask him what it is, he has to look through that whole tangled mess of random memories to remember it's name. By the time he finally finds the memory of what the giraffe is called, I'm holding up a different animal; asking what the name of that one is. But, Sara says she thinks he might be working out some sort of order for something that is otherwise order-less. You see, he knows he remembers things that have a specific order; like the abc's and numbers. and 2 always comes before 3. In other words, he's figured out that having an order to something - like the alphabet - can help him remember anything - like the animals! He has figured out that it's easier to remember things when they have a specific order. So - he creates order! For the sole purpose of communication! It's incredible! Sara: *holding up the giraffe* "What animal is this Noah?" And Noah, in all his wisdom, will reach back in his mind and look past his tangled little web of memories and instead of searching aimlessly through the chaotic, interlaced lights (and those shiny little distractions) that try to dominate the forefront of his mind, he can look for the cord that has the order of the animals. That cord of lights is separate from the tangled web. He knows exactly where it is. It's a straight, fixed, and permanent cord. Probably right next to the alphabet and the number cords. All he has to do is follow the lights - (lion, cow, giraffe!.....It's the giraffe, mommy!) - and he can come up with the name! He hasn't learned to actually say the word yet. But he knows what the giraffe is. "Quick - what letter comes after J?" Did you sing just a little bit of the alphabet song before you could remember? You followed a cord of lights. I think Noah does that a lot. And there's the rub, isn't it? The information I do get, I try to get from Noah's therapists or autistic people themselves, or the parents and caregivers of one because I feel like that's the best source (admittedly, it's mostly on YouTube or books); but they are always very careful to say that every person is different and what happens within their own bodies and minds and families might not apply to the body or mind of the person in our family. It's all just purposeless; unintentional and completely random. How are we supposed to know?! Because at this point in my writing process, through all the edits and deletions and additions and grammar checks, I've usually found some clever little pearl of wisdom that is sometimes worth sharing. Something I've learned about Noah...or myself...or something. And even though I feel like we really might be onto something this time - I also feel that always-lingering self doubt kick in. Telling me I can't know. Not for sure. And, so now, I feel like maybe you're just getting the ramblings of a confused grandmother. Trying to figure out what the hell is going on. And I'm just hoping I'm right. Come to think of it, I guess that's all you ever get; just ramblings. Because everything I've ever written about is really just a guess. Some belief about what might be going on in that mysterious little mind of his. that annoying self-doubt always rearing it's ugly head. Making me wonder if I'm right. Or if everything really is just a guess. But aren't all great theories just a guess in the beginning? A question about why "this" or "that" is happening? All we have to do now is prove our theory, right? It can sometimes be exhausting. Trying to prove that theory. Watching every little hand gesture and wondering if it's some new sign he's trying to show us. might mean something more than it actually does. Or, even worse, worrying that you missed that one moment when he finally did figure something out and now you don't even know he possess that knowledge; so now you can't encourage it and excite his eagerness for learning more. "I think and think for months and years. Ninety-nine times, the conclusion is false. The hundredth time, I am right." I'm not sure if Einstein had kids but I think that if that quote were about his kids and not his science, he might have changed it to the two hundredth time before you are right. Well, we've been thinking and thinking for months and over two years about Noah. And, we've had our fair share of false conclusions. "Ramblings of a Confused Grandmother." It might be a little more accurate.